The bog standard Wild Turkey was one of the first bourbons I tried when one of the pubs in our local town suddenly started stocking a few bourbons. I remember there was this and Knob Creek (which we found highly amusing at the time) and a couple of others. That was a good 15 years ago but I remember really enjoying it back then. The Wild Turkey 101 is well known as a solid whiskey and would be high up on most peoples list as a daily drinker. I love the Wild Turkey Rare Breed and usually have a bottle of this and one of that sat on the shelf. This bourbon has a high rye mashbill and they use a heavy char on the barrels which give it a distinctive wild Turkey flavor profile. “For more than 60 years, legendary Master Distiller Jimmy Russel has been crafting Wild turkey 101 the right way. With a high rye content, this iconic bourbon is perfectly aged for up to six to eight years in American oak barrels with the deepest char for more character. Spicy from that high rye. It is also slightly sweet but it’s the spice that dominates along with baking spices, cinnamon, sponge cake, popcorn and scones. Spicy again but with lots more caramel on the palate. It’s quite “corny” if there was such a thing as caramelized corn that is how I would describe it. More baking spices with nutmeg, almonds and cashew nuts. Toffee and oak also in the mix. More of the same on the finish with caramel and rye spice fading to cloves and some nutmeg. An extremely likable bourbon especially when you consider the price. Not sure how much it costs in the States but I picked this up for less than £30 (around $38) which for a high proof bourbon of this quality feels like some kind of robbery on my part. I have even had this cheaper than that in the past. So pound for pound it’s one of the best bourbons on the market and a great daily drinker that I think most would have in their collection. It stands up to far more expensive whiskeys. It has an awesome caramel and spice bourbon and would make a good choice for anyone wanting to make the step up into higher proof bourbon for the first time. To sum up… go and buy a bottle. 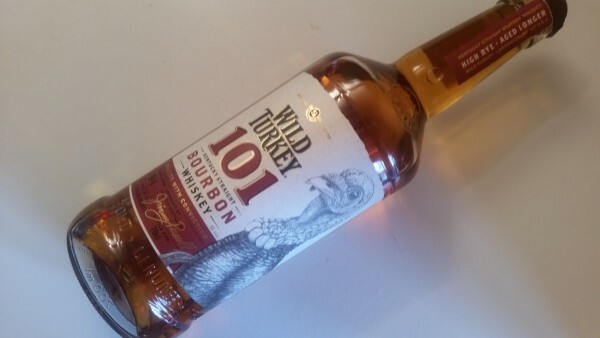 This Wild Turkey 101 review originally appeared on WhiskeyBon.